Hurricane Matthew has just passed us here at South Florida. What a relief! A Category 4 Hurricane is no laughing matter. It is the kind of storm that rips out roofs and windows. We were told to stay indoors for two days. We were fortunate to not suffer any power outage. Naturally I filled my hours with a lot of cooking, baking and pasta making! Being a hurricane prone state, officials and media were putting out press releases and warnings to get everyone prepared. Within 48 hours, the entire city is on lockdown with no one in the streets. No evacuation orders. But homes were fully stocked with supplies, water, torch lights and a list of emergency items to stay indoors and wait out the hurricane. We were told Hurricane Wilma, which was the last major storm in 2005 to rip across Florida, did some major damage to buildings and infrastructure. So glad Matthew did not come a-knocking. Spent the last two days noodling about in the kitchen - literally, made egg pasta and chinese egg thin noodles. And found out, it is the easiest thing to do. The hardest part is only in the kneading. Which is a great workout imho, because you can't go out and all amenities in our building was closed due to the hurricane. Meaning I could not go to the gym to kill time. Noodle making is the perfect way to spend time indoors. I figured, even if we had an outage, the noodles should be ok to keep in the freezer. We had two gallons of water already frozen in the freezer, ready to go. In a power outage, this would be handy to keep food cold in the fridge! One of the things you learn living in a hurricane zone! Making noodles pretty much is a 3 ingredient recipe. Flour, eggs, oil. There are fancy ones that add baked soda (not baking but baked!) and a bunch of chemicals. I suppose they are added to help them last longer? I don't know. I'm happy with a simple recipe. Making noodles with a manual hand rolling machine is so much fun! The difference in egg pasta and chinese egg noodle, I learnt, is in the egg content. More egg content in a chinese egg noodle recipe, compared to egg pasta. However, I have also read that alkaline is an important ingredient in those yellow egg noodles we find in restaurants. Haven't ventured down that path yet. But I'm pretty happy with how the noodles turned out. I had bought a manual pasta maker several months ago but never did break it out. Had I known it was so simple to make, I would have done so earlier. I guess I was waiting to finish up our stash of instant indomee before making noodles. Well, now, I'm proud to have a stash of thin egg noodles lying in my freezer ready to when the mood strikes. So this post has two recipes. If you want to read more on egg pasta and the varieties you can make with them (squid ink, spinach, herb pasta! ), you can head to this recipe, which is where I found the recipe for my egg pasta. Lots of step by step pictures, without using a pasta maker. Very rustic way of making pasta. Well, no excuse now if you don't have a pasta maker (although it totally helps and makes life so much easier!). Then there's the Chinese egg noodle recipe I found. Which, in my opinion is a little strange. There is no oil in their recipe. I followed the recipe exactly and I had a hard time trying to knead the dough and bring it together. So using my instincts I added two tablespoons of vegetable oil and voila, it started to dough up very nicely. So my recipe has an extra ingredient from the original blog post. Ok here goes. How to make egg pasta and How to make Chinese egg noodles. Egg pasta with just 3 ingredients! Takes 60 - 90 minutes , Serves 6 or more. Using a cool surface, pile up 2 cups all-purpose flour and create a crater in the middle enough to hold oil and eggs without spilling over. Add olive oil and eggs into crater. Using a fork, start to pull in the flour and mix wet and dry ingredients to combine to work into a dough. You may need a dough scraper to help with scraping the sticky bits to combine with the dough. Using clean hands, knead dough for a further 10 minutes till mooth and pliable. Set aside, covered with cling wrap, for 30 minutes at room temperature. Cut dough into 4 equal parts. For each portion of dough, roll out pasta with a rolling pin, folding a few times. Roll out to a desired thin consistency. You may need to sprinkle some flour to keep it from sticking to the surface or rolling pin. 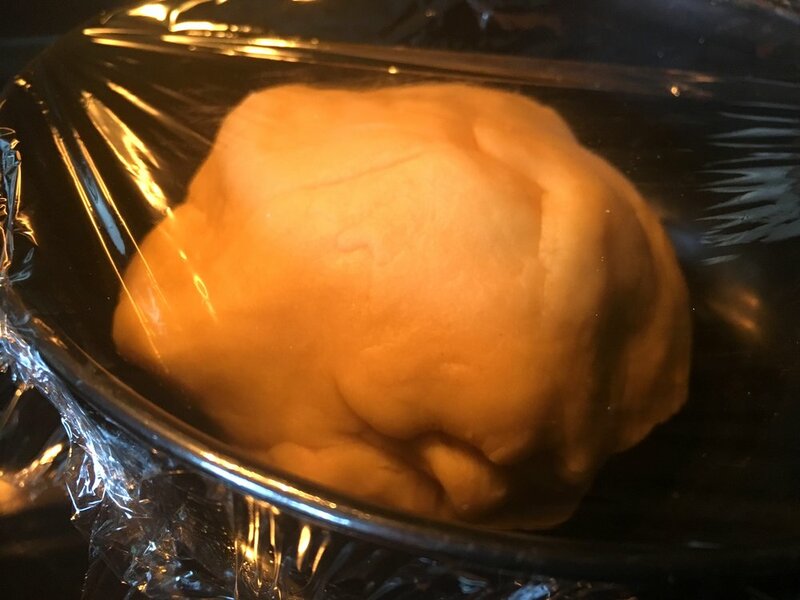 If you are using the mannual method, make sure you flatten dough to desired thinness. Then, lightly fold the thin rolled pasta like you would a letter in a single horizontal fashion (don't fold across each fold) and then cut into strips as desired. If you have a pasta maker - roll the dough into sheets, folding a few times and shift machine settings to thinner pasta sheet sizes as you go along. Once desired thinness of pasta is achieved, roll through pasta cutter carefully. You may want to cut each sheet to size if each sheet is too long. Sprinkle more flour onto cut pasta and mix lightly so that pasta will not stick together before cooking. To cook pasta, bring a large pot of water to a rolling boil. Season with salt and a spritz of olive oil and submerge pasta into boiling water. Pasta should cook in about 3 - 4 minutes. Drain, set aside for use with pasta sauce. PS: I tend to rinse my pasta with tap water after draining to get rid of any chalky flour taste. Takes 120 minutes , Serves 6 - 8. Add salt, vegetable oil and eggs into crater. Using clean hands, knead dough for a further 10 minutes till smooth and pliable. Set aside, covered with cling wrap, for 60 minutes at room temperature. For each portion of dough, flatten with a rolling pin, folding a few times. Roll out to a desired thin consistency. You may need to sprinkle some flour to help with the rolling if it gets sticky. This recipe will require a pasta/noodle maker - roll the dough into sheets, folding a few times and shift to thinner sheet sizes as you go along. Do not roll dough too thin as you want to have enough thickness during the thin noodle cutting step. I stop at number 4 (out of 5. 1 being thick, 5 being the thinnest). Roll through thin noodle cutter carefully. You may want to cut each sheet to size if each sheet is too long. Sprinkle more flour onto cut pasta and mix lightly so that pasta will not stick together before cooking. Pre-cook noodle before use. Bring a large pot of water to a rolling boil. Season with salt and a spritz of olive oil and submerge noodles into boiling water. Noodles should cook in about 3 - 4 minutes. Drain, set aside for use as a stir fry or soup noodle. As with the pasta, I also rinse the noodles with tap water after draining to get rid of any chalky flour taste.